Guest Post: Swimming Principles . . . They Work! I met Patrick Quinn poolside in May 1989. I was attending my first ‘short course’ U.S. Masters Nationals at Mission Bay Aquatic Center in Florida. Patrick and I were both waiting for our heats in the 1000-yard freestyle. I was 38 at the time; Patrick was 58. 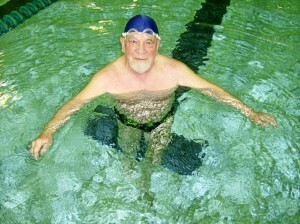 Today he is 84 and I’m 64, and our friendship has deepened over the years over our shared love of swimming. Today in the 50-meter outdoor pool I remembered them once more…and loved the feel of the water in the early morning. And I also know that if I re-read Terry’s principles or re-view his freestyle videos it will get the old blood pumping again. It will re-kindle the desire to feel the beauty of flowing with the water. A hurdler in high school, Patrick turned to middle-distance running in college and captained his University College Dublin Track & Field team to victory in the All Ireland Inter-Varsity championships. He loved to swim but never seriously competed. Once, dragooned into 5m platform diving for his high school, he had finished dead last in the Leinster (Provincial) Championships. Marriage, a family of six and the serious work of building a career both in Academia and his profession of architecture meant a twenty-year hiatus from serious exercise. A triple coronary bypass in 1979 (a month after playing in the United States Amateur Public Links golf championships) commanded his full attention. A Fellowship to the American Academy in Rome allowed him to spend six months recovering through extensive walking in that beautiful city. Returning to the USA he began to swim for physical therapy. Someone suggested he join US Masters Swimming. By 1985 he was competing in local Masters events and the State Senior Games. Several attempts at the Empire State (NY) Games persuaded him to enter his first US Masters national championships in Boca Raton Florida, He was delighted to gain an eighth place medal in the 1000-yard freestyle, ten years after his heart surgery. There he first met Terry Laughlin and became a fan and a friend. Thanks to coaching by Jeff Maxwell and the wise advice of Terry Laughlin he became a moderately good breaststroker and later a distance swimmer. He learned to apply certain techniques from his days as a track miler to distance swimming and even to breaststroke sprints. One notable result was his first gold medal at the Empire State Games, where less than two seconds covered the eight finishers in the 50 m breaststroke. His swimming career has been both varied and delightful, checking out pools, lakes, rivers and oceans from Indiana to India, from the Atlantic to the Gulf of Mexico. His wise and beautiful wife however, put her foot down when he wanted to swim across the River Ganges in the Holy City of Varanasi. Meets in Ireland, Canada and across the USA meant making friends with a fascinating diversity of men and women each of whom had a unique reason for swimming. 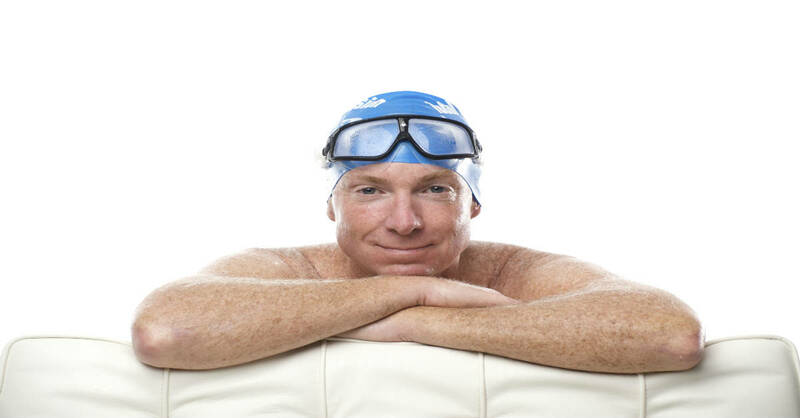 His proudest moments were an eighth place finish in the FINA World Masters 3k open water championships in San Francisco, and making his first World’s Top Ten in the 1500m (SC) at the tender age of 80, the same year he became the oldest member of the USMS Long Distance All-Star Team. He looks forward with some anticipatory glee now to aging up into the eighty-five year plus bracket. He knows that he will be slower but he also intends, through increased efficiency to make it “feel” smoother and therefore more pleasurable. He’ll never make the Hall of Fame at Fort Lauderdale but his children and grandchildren will keep him in theirs. Wow! His story is incredible! I can’t believe it…. to go from being a non swimer in his childhood to medaling in the 1000 yd freestyle. That takes not only dedication but great courage as well! Great read! I’ll use his story as a motivation tool on those early mornings I may not want to get up in time for morning swim. I too have known both Terry and Patrick for many years and both are an inspiration to all swimmers. Patrick was a great middle distance runner which is a remarkable accomplishment for someone of his stature. I also ran track and we reminisced about our track days. What impresses me most about Pat is his humility and his thoughtfulness. His tribute to Picket Simpson stands out in my mind as an example.